In over 2 months in South America, we met no other traveler who had been to Paraguay (including travelers who had been travelling for over a year within the continent). We kept hearing that there’s no tourist infrastructure in the country and not much to see. For whatever reason, these are exactly the kind of things we like to hear. The places most off the tourist track seem to always deliver surprises. Paraguay was no exception. We were only in the country a couple of days, but this allowed us to sample a small piece of its culture. 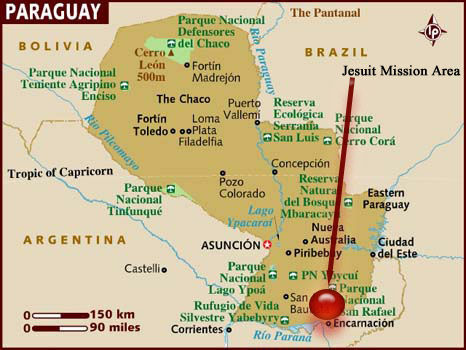 We visited Jesuit missions that were preserved in a way that easily allowed you to step back in time. We also visited a couple of small towns filled with people of German descent whose ancestors flocked to this area in the early 1900s and, according to several reports, became the hiding places of several Nazi war criminals fleeing Germany after the end of World War II. Paraguay feels more like the South America you would imagine. While many cities in Argentina and Chile resemble many modern American cities, Paraguay is a different world. As soon as we crossed the border into the country, the changes were stark – dirt roads, donkeys pulling carts, women wearing traditional dress and vendors selling every good imaginable. If you’re looking for a different scene and to experience a place untouched by mass tourism, Paraguay is a worthy detour. Hotel Tirol (April 30 – May 1, 2008) – It’s a good thing that neither of us had seen The Shining recently because, if we had, we probably would’ve been in for a sleepless night. This hotel ($55 a night) was very pretty – probably about 75 rooms spread out in old-fashioned stone buildings that sprawled over an estate in the middle of nowhere, and it was absolutely deserted – we were the only guests. The website advertised 3 pools. Luckily, it was too cold and rainy to swim because the pools certainly hadn’t been used in the last decade. We arrived spooked by recently acquired info that the hotel had once been used as a haven for Nazis escaping Germany after World War II, and the old German grandmother sitting silently in the corner of the hotel pub didn’t help our situation. Our room certainly hadn’t been renovated during our lifetimes, but it was clean and comfortable – once we shook off the eerie feeling of being there. Hotel Tirol Restaurant – The reheated leftovers this restaurant served up for dinner were actually pretty good though, again, we were the only people there. Papillon Restaurant – In another testament to the strong German presence in this area, this place was a German buffet. And it was good, really good. From potato casserole to knackwurst to apple cake, we definitely enjoyed our lunch – maybe mostly because the flavors were so different from anything we’ve tasted recently.